A powerful Frag Grenade in your pocket, among other Ammunition, can be a big surprise for any enemy in the Evolution: Battle for Utopia game. – Frag Damage. Good as for unarmored targets (100% damage) and as for armored (100%). This type of damage is most common among grenades (4 of 9). Most players use G-2 Frag Grenades to pass through most enemies (instead of more expansive G-3). Save your at least for G-2 Frag Kit, rather more useful then G-1 Kit. 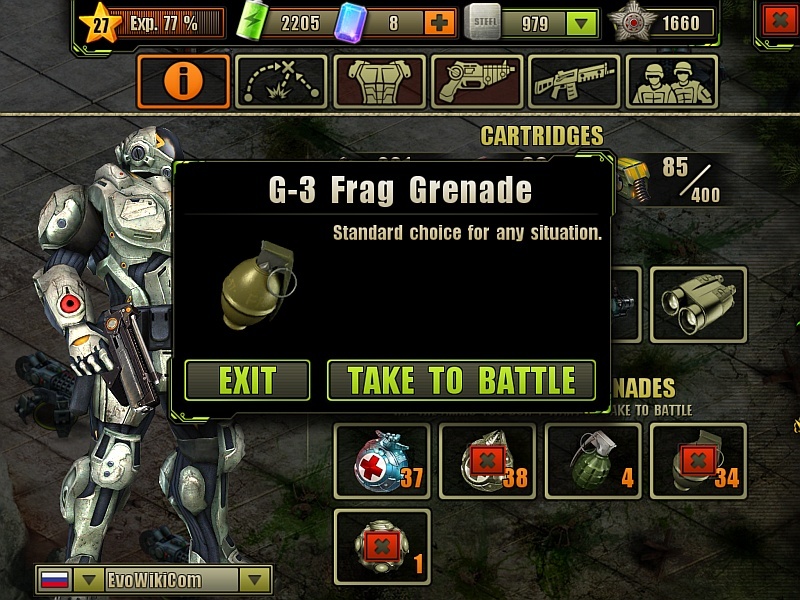 To keep some valuable G-3, G-4 frag grenades you have during easy combats, you can tap on them in your profile screen and don’t take them to those battles. Do You Want to Take G-3 Frag Grenades to Next Battle? Oh no… I didn’t know that G4 grenades couldn’t be produced by us and I had an offer yesterday from smuggler… I’m waiting to research G3 grenades Kit! Also would like to know if the G1 Incendiary grenades and the kit are worth to research. You can find information about Incendiary grenades and kit at this page. I was looking for kinda personal opinion from those who has researched and produced it! You can produce g1 flame grenades only. You will need it in few spec ops. It’s also can be useful against live enemies as its damage increased to 30%, comparing with common g1 grenades. But its useless against armored targets. And g2 are still better in any situation. Oh, and you will need crystallite to produce it. My opinion – to take a Kit is a bad choice. About G1-Incendiary/fire grenades… I might be a rookie but… I find them rather useful at my level, especially when dealing with L3/L4 errors/threats /snipers, demolishers teams/. I’m unsure the G1-Incendiary kit its worth the price in gems but surely having a pair of G1-incendiary grenades it’s fully worth the effort of carrying them around. Well, that depends on the type of game you like to play. I have chosen not to research the incendiary G1 frag kit. However I loved to have that Dragon pistol! It was badass at those earlier levels. Now, at later stages, I haven’t researched Dragon 2 because I rather have the Kurbatov’s which is useful against regular and armored targets! There will be needed a few incendiary grenades to finish some of the operations, spiders and ripper! Although, kit is not mandatory indeed. Just to let know that some will be needed! The power of g3 grenade can fluctuate. It is not always the same all the time. I am at level 75 and so the power of my g3 grenades should be about 4200pts. However sometimes in p2p combat a g3 will destroy a Matriochka or a Terminator immediately. Sometimes it will only inflict minor damage to them living the enemy pretty much alive and shooting. It is quite disturbing when it happens.